The Blog of Hayden Sutherland, an eCommerce, Online Marketing and Digital Strategy consultant based in Glasgow, Scotland. These are my thoughts on how companies can take advantage of the modern interaction technologies and methods to improve communications, influence behaviour and retail online better. Can I please suggest you speak with your digital marketing agency pretty quickly and find out why they can't even spell the name of your flagship motor vehicle? 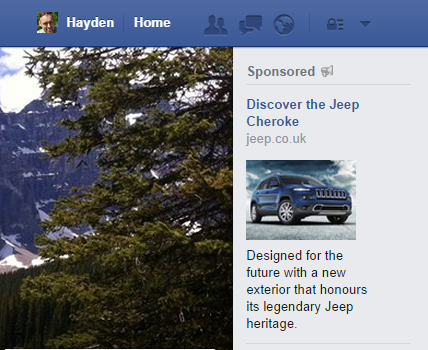 You would have hoped that the people creating the Facebook Adverts to entice people to view your large family 4x4 would be able to actually spell..... wouldn't you?